Do you ever feel like yelling “STOP!”? And then last weekend I found sometime on my hands and it felt strange. I thought it would be a welcome change to sit infront of the TV and watch reruns but the funny thing is that it took the whole of five minutes for me to get the urge to do something else. So this gnocchi was the result of that weekend impulse – I decided to pick up Maggie Beer’s cookbook, “Maggie’s Kitchen”. I’ve had this book for a few months already and had never cooked from it. It was a late discovery but an important one. I found myself thinking “Yes, yes I’ll make this!” as I flipped through the book’s pages. Of all the dishes, that day, the potato gnocchi dish stood out. I like how Maggie recalled how she went through three or four techniques before finding her preferred method – don’t you love it when they do all the experimenting for you? 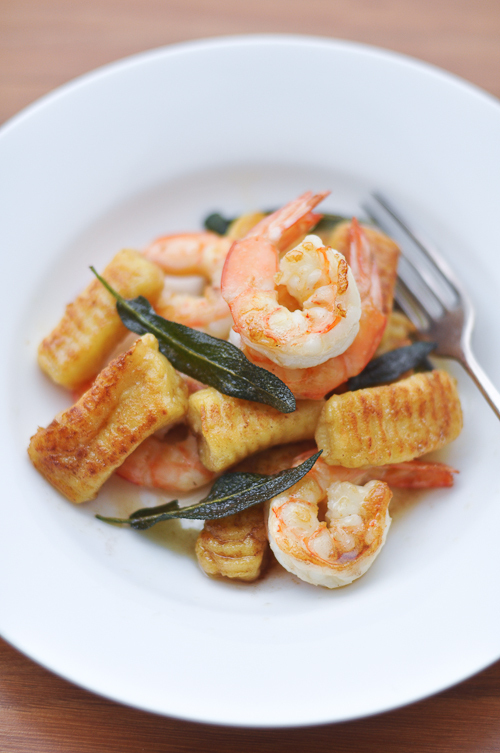 So thanks to Maggie Beer – here is the best gnocchi I’ve tried – crispy on the outside but delightfully delicate inside. The dish is made with a burnt butter and sage sauce, topped with pan fried prawns. Instead of roasting the gnocchi and sage, I have pan fried mine but I have also added a link to Maggie Beer’s original recipe below. Either way you choose to follow – this will be delicious! Steam unpeeled potatoes for 30 minutes or until cooked through but not falling apart. Set aside until just cool enough to handle and then peel the potatoes. Pass the potatoes through a ricer in a bowl and then add the eggs and salt. Place the flour on a work surface and spread the potato mixture on top. Working quickly, use a pastry scraper until it comes together for form a dough. You may not need to use all the flour on the surface, stop incorporating the flour when the dough is smooth and does not feel sticky to the touch. Handle the dough as little as possible to ensure a light gnocchi. Divide the dough in quarters and shape each quarter into a long sausage, around 15 cm in length. Cut off 1.5 cm pieces and gently press the tops with the back of a fork tine or gnocchi maker. Bring a large pot of water to a boil and and a hand full of salt. Add the gnocchi and cook until they float to the surface (it shouldn’t take very long, around 30 seconds). Drain well. Heat the olive oil and half the butter in a frying pan and pan fry the gnocchi, just until golden and place in a serving plate. 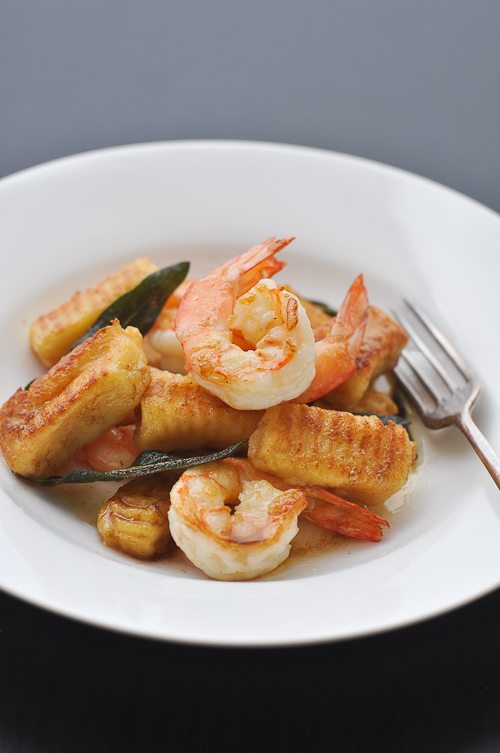 Pan fry the prawns and place over the gnocchi. Wipe the frying pan clean and add the remaining butter. When the butter starts to smell nutty and brown, remove from the heat and add the sage leaves. Fry off for a few seconds until crisp then add the balsamic vinegar. Pour over the prawns and gnocchi. Serve warm. Note: Gnocchi can be made ahead of time, shaped and frozen. If cooking from frozen there is no need to thaw – just drop in boiling water. When they rise to the surface they’re done.